Laura has given us a free week to create some art remembering people who have suffered in disasters in Canada, but also all over the world. We're only half way through 2013 and it seems this year has seen a record number of storms, fires, bombs, and people just not thinking clearly. I used a piece of 9" X 11" mixed media paper, traced my hands with a Black Sharpie marker, Zig 01 pen to do the tangles and a red Micron 005, then Prismacolor pencils to color my hands and create an aura and Gambasol to blend the pencils. Sometimes humans seem very divisive toward one another, but it seems in times of trouble a better part of human nature rises to the top and we step up and help those we see with a bigger need than our self. Our thoughts and prayers go out to all who have lost their most precious family members, pets, and possessions and who are having to start their lives all over again. You can't replace those you've loved but they remain forever in your heart, but possessions can always be replaced. Chin up, look forward, and keep steppin'. I just love your helping hands, so appropriate for this challenge. Nice job on the tangles and it is a fitting tribute. I must say that this one is my favorite in thought and so fabulously done! 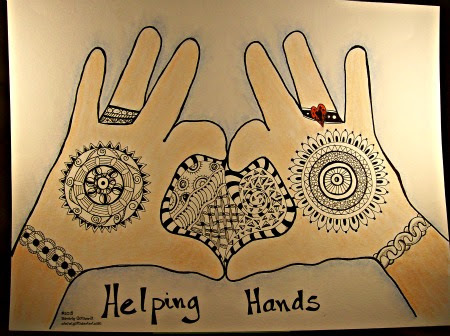 Your helping hands are beautiful. I love the idea of the fingers shaping a heart. Very touching. You did very well with these hands! Thank you for sharing your great thought and the wonderful ZIA, that fits with it so beautifully!! Very thoughtful and rich in design.